Above: Then trooper, now Texas Ranger Kyle Dean poses next to his 1990 Texas Highway Patrol Ford Mustang in Crockett, Texas. Unit #M0-610. This is a 1987 model Ford Police Mustang used by the Texas Highway Patrol. It was driven by Trooper Greg Sanches, THP-Lufkin and Trooper Roy Owens, THP-Lufkin. It is shown parked at the Texas DPS area office in Lufkin, Texas. This DPS Mustang had red interior, a 5-speed manual transmission, Decatur radar, Motorola Syntor 64 channel VHF radio system, am/fm radio, and Tomar strobes on the front. The Mustang in the background is a 1986 GT. Above: A 1987 Texas DPS Mustang has just been given a bath! Yep - This is an '87 because it has only one spotlight on the driver side. The wheels were black but the trooper liked the aluminum finish so he removed the black paint from the wheels. This Mustang was driven and retired by Trooper Van Loggins, THP-Shepherd. Photo & information courtesy of Trooper Van Loggins, a 27 year veteran of the DPS. 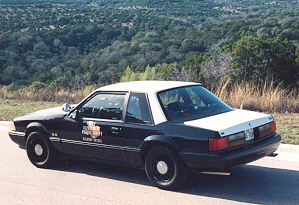 This is a 1990 Ford Mustang LX used by the Texas Highway Patrol Service. This unit was driven by Trooper D.L. Pruett, THP-Austin. This photo was taken near Austin, Texas in the summer of 1991. 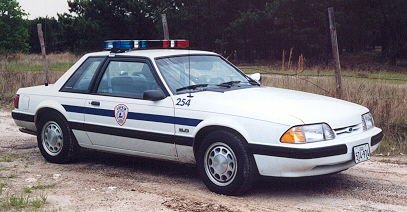 The 1990 DPS Mustangs came without the factory painted black police wheels. But Trooper Pruett liked the black wheel giving it more of a "police appearance" so Trooper Pruett, a long time veteran of the Texas DPS and one of the original test pilots for the Ford Police/Texas Highway Patrol Mustang program in 1983, decided he would paint them black anyway! Above: Three Texas DPS units. On the far left is a 1988 Texas Highway Patrol Mustang, on the right is a 1987 Texas Highway Patrol Mustang and in the background is a four door sedan. An unidentified HP corporal speaks with a trooper in the '87 Mustang. This picture was made on the north side of Austin, Texas near IH-35 & Highway 183 sometime in 1988. Above: Texas Highway Patrolman Kyle Dean poses with his 1988 Texas DPS Mustang. Picture date: May 1988 in Crockett, Texas. Unit # M8-617. Another view of unit # M8-617 that ws used in the Crockett, Texas area. 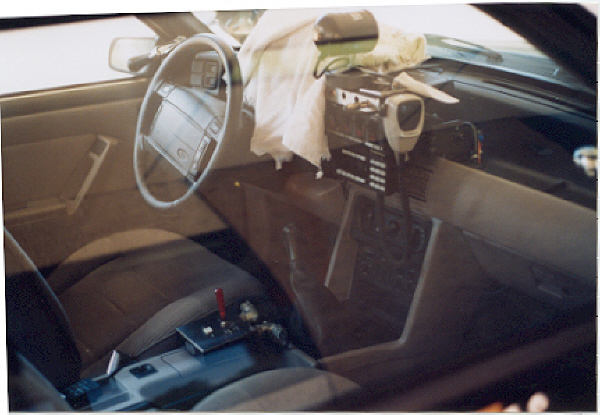 Above: The inside picture of a 1990 Texas DPS Mustang. Photo taken in summer 1991 at the highway patrol office in Lufkin. Above: This is a 1990 Texas Highway Patrol Ford Mustang with red interior and 5-speed transmission. It's believed this photo was taken in 1991 in Crockett, Texas. Photo source: Unknown. This is a 1990 Ford Mustang LX police sedan. It was purchased from Al Meyer Ford in Lufkin by the City of Lufkin in March of 1990. It was primarily used as a drug interdiction unit. It was also used as a traffic unit and on rare occasions a patrol unit. It was driven by Officers Rodney Bivens, Gerald Williamson, Phil Davis, Sgt. David Walker and Officer Anthony Mitchon. This Mustang had a 5-speed manual transmission, blue interior and power locks/windows, Decatur radar, old style Motorola Syntor radio, Whelen strobe lightbar and new for 1990, a police certified 160 mph speedometer! It was retired from Lufkin PD service in July 1993 and sold to a local county Constable. After its life with the Constables office, it ended up in the Cleveland, Texas area. 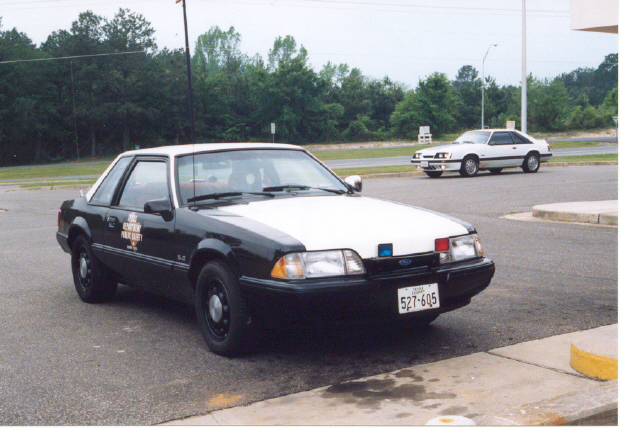 Below is a picture of the Lufkin PD Mustang before it was placed into service. The lightbar had been mounted but the striping and decals had not been placed on the doors. Still had the paper tag in the back window and dealer ad in the license plate area.